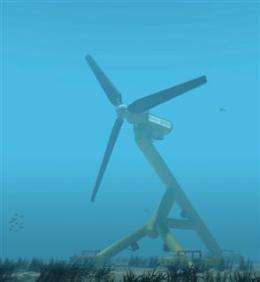 (PhysOrg.com) -- Taking advantage of the steady sea currents that flow through the underwater canyon walls in the sound of Islay, off the southwest coast of Scotland, between the islands of Islay and Jura, the Scottish energy company ScottishPower Renewables (SPR) has been given the go-ahead by the Scottish government to begin installing 10 underwater HS100 tidal turbines (made by Hammerfest Strom, a Norwegian company) on the ocean floor. As countries all over the world seek energy alternatives to oil and coal, the UK, and Scotland in particular have come to see the value of tidal currents as a renewable resource, and no wonder; according to John Swinney, the Scottish finance secretary, the waterways around Scotland comprise nearly 25% of Europes total tidal resources. The choice of the HS100 follows up experience learned from the installation of a 300kw experimental operation in Kvalsundet, Norway, which has been running for six years. SPR is also currently installing a single unit in Orkney (the small island chain in the north of Scotland) to provide a learning lab for the eventual installation in the Islay Sound. The new 10MW current farm, similar in appearance to an underwater wind farm, will be the largest such operation ever undertaken, and is expected to more than double the energy capacity now being used on the existing grid to support over 5000 homes and businesses. The site chosen is ideal due to the continuous 11 kilometers per hour speed of the current (6.7 mph) between the islands and the relative lack of strong storms; also the need for additional power on the two whisky producing islands will provide a means of expansion for the local malt whisky industry. Harnessing underwater currents is seen by many in the environmental arena as an extremely green form of energy production, as the turbines are out of sight and dont produce any pollution, though there is some concern about the effects of noise on dolphins and whales. All signs indicate that the local citizenry are pleased with the announcement of the project due to the expected injection of cash into the surrounding economy and the jobs that will be created. The installation of the current farm is expected to cost £40 million ($65 million) and will go a long way for Scotland in meeting its stated goal of deriving 80% its energy needs from renewable resources by 2020. Work is expected to start in 2012, with completion of the project in 2015, according to SPR chief, Keith Anderson. 3.3 million of these turbines would supply ALL of the power needs of the US (29PWh/yr including fossil fuels per Wikipedia) at an up front cost of 21 trillion. Yikes. Also, at 10 cents per kWh, the installation in this article would pay for itself and start making profit after 7-8 years. All "back of the napkin" of course. @ iselin - Nice calculations. I think the story really needed to show that...uh...this is economical renewable energy, the golden grail. Missed factor - Mainenance costs - water, being dense will create mechanical stress, and salt water - corrosive, will mean higher maintenance costs. However it sounds like scottland is particularly well situated for it, compared to the US. Holoman - doubtful. Water is more forceful than air, so the blades can handle a higher torque conversion and move slower (A lot slower than ship propellers). Also, dolphins and whales aren't the dumbest animals in the sea. They see a giant moving blade like that and will probably avoid it anyways, regardless of the actual danger. No they are not that fast im told. I wonder, would shrouding the blades in a venturi increase efficiency? Wind Farms kill Whales. And Eagles. And Hawks. Evil. Are the blade speeds sufficient to slice large sea creatures into pieces?